You thought the addition of Bejeweled to World of Warcraft was a potentially potent potable? That's nothing compared to the deadly cocktail that is PopCap's Peggle, also available to play in Blizzard's ultra-popular MMO. Bejeweled Coming to Warcraft. Yes, Really. But the game within a game also mixes up standard Peggle play. While the WoW version comes with just two "Peggle Masters," players can earn "talent points" that will affect the way the game is played. 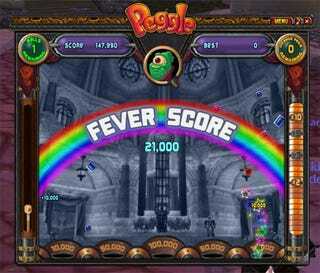 Like World of Warcraft, the new version of Peggle features a skill tree, letting players modify their shots with higher points, a chance for "critical hits" and increased fever scores. It's like a video game equivalent of an eightball, one administered right through the retina. WoW Insider has more extensive details on the Peggle add-on, but if you'd prefer to play it instead of read about it, it's now available for download.